The official opening of the Advisory Centre on WTO Law today is a (small) historic moment in its own right. But it is also part of a larger development: a growth of the judicial settlement of disputes reflected in a growth in the number of international judicial institutions. Many new international rules, laid down in multilateral agreements, have been created over the last two decades. Many new international courts and tribunals have been instituted with a view to facilitating the application and enforcement of those rules. I will just mention the International Tribunal for the Law of the Sea, the various War Crimes Tribunals, for the former Yugoslavia and Central Africa, and the International Criminal Court. The Panels and Appellate Body of the WTO’s Dispute Settlement Understanding are part of that development, and probably the most prolific part, with some 240 complaints lodged and some 56 final judgments rendered in six years. Today, and within the framework of the WTO dispute settlement system, the Advisory Centre for WTO Law takes another, almost revolutionary, step forward in international adjudication, by establishing itself as the first true centre for legal aid within the international legal system. (ii) continuing social inequality which, combined with the increased costs just mentioned, made for a restriction of access to justice for large parts of the population, often precisely those social layers that were supposed to be supported by the new rules. Simple pro bono systems were insufficient to solve the problem of access to justice, mainly because of its sheer size. The steps taken to remedy this problem consisted inter alia in (State) subsidized legal aid, often concentrated in so-called legal aid centres. Some of the elements that I have just mentioned as contributing to the considerable problem of access to justice in national legal systems, can also be recognized in the international legal system with its proliferation of legal rules and of courts. The WTO is a case in point: it has expanded the rules of international trade manifold compared to the GATT and created a new “court” system with a possibility of appeal. Accordingly, legal advice in this sector is very expensive. Thus creating considerable problems of access to justice for developing countries. It is, therefore, fitting that, today, the official opening of the Advisory Centre on WTO Law marks the start of a true legal aid centre on an international scale. Individuals appearing as defendants before War Crimes Tribunals have always been able to call upon pro bono legal aid. The International Court of Justice has a small fund out of which costs of legal assistance can be paid for countries who need such help. But today marks the first time a true legal aid centre has been established within the international legal system, with a view to combating the unequal possibilities of access to international justice as between States. States have banded together and have created a multilateral treaty supported by a substantial guarantee fund, which makes subsidization and the provision of high quality legal aid to States which need such help possible. The seeds of this system can already be found in the DSU. Article 27, paragraph 2, provides for “additional legal advice and assistance” (additional, that is over and above the normal assistance to all Members) “in respect of dispute settlement to developing country Members”. The Secretariat shall accordingly make available “a qualified legal expert from the WTO technical cooperation services” to any developing country. However, such assistance could not go beyond a certain point because the Secretariat had to preserve its impartiality, according to this provision. It was inconceivable that one part of the Secretariat would help a developing country litigate a case, whilst another part of the Secretariat would help the Panel write the report on that case. The Centre, however, can go beyond the point at which Secretariat assistance to developing countries had to stop, and provide full-fledged, high-quality, legal aid in all stages of the DSU procedure, including the Panel and Appellate Body stages. As Director-General and as a person who has always believed in the importance of providing good legal aid in order to combat inequalities in access to justice at the national level, this gives me enormous pleasure and I wish the Centre all possible success in its endeavour. I would like to end with some special praise and congratulations. First of all, to the Swiss Government for hosting the organization and granting it the same status as the WTO itself and thus greatly stimulating and simplifying the start of the organization. Secondly, I would express my respect to Frieder Roessler, who after a distinguished career as GATT and WTO legal adviser, and at an age at which he would be entitled to indulge in his favourite pastime, ocean sailing, has taken it upon himself, as expert helmsman, to bring the Centre up to speed as a top quality legal aid institution for international economic law. And last, but not least, to those who have been dubbed the father and mother of the Centre, Otto Genée and Claudia Orozco. After Claudia had to leave Geneva about a year ago, Otto has, with great perseverance and energy, brought the Centre where it now is: at take-off. Your Excellencies, Members of the Management Board, Ladies and Gentlemen. It gives me great pleasure to speak to you on the occasion of the inauguration of the Advisory Centre on WTO Law. The Centre represents the collective efforts of many individuals, and many WTO Member governments. I wish to congratulate all those involved in the conception and development of this important initiative for your vision, and the dedication with which you followed this vision through. The establishment of the Centre is an important step in advancing the interests and securing the rights of developing countries in the WTO dispute settlement system. WTO Members have demonstrated their confidence in the new dispute settlement system in bringing more and more disputes to the system. There is no indication that recourse to the WTO dispute settlement system will slow down in the future. It has been said that panels and the Appellate Body have made a considerable contribution to the development of WTO law, thus enhancing the “rule-based” character of the WTO. But it is obvious that there would be nothing for us to decide without the WTO Members who bring their disputes to the system. It is the Members of the WTO who have the ultimate challenge in ensuring the endurance of the rule-based system. WTO Members who bring disputes to the system do so because they feel that certain rights accruing to them have been nullified or impaired. But there is more to participation in WTO dispute settlement than the preservation of the rights of individual Members. Article 3.2 of the DSU states that the function of the dispute settlement system is “to preserve the rights and obligations of Members under the covered agreements, and to clarify the existing provisions …” It is only through participation, and through engagement with the system, that WTO Members can influence the outcome of rulings and recommendations, and thus contribute to the growing body of WTO law. Speaking at an UNCTAD conference about a year ago, my friend and colleague on the Appellate Body, Ambassador Julio Lacarte-Muro, spoke of the benefits that developing countries gain from participating in the dispute settlement process. But he also spoke of the benefits that the multilateral system gains from the participation of developing countries. We have seen a number of different WTO developing country Members participating in both Appellate Body and panel proceedings. The very first dispute to be brought to the Appellate Body involved two developing country Members, Brazil and Venezuela. More and more issues are coming before panels and the Appellate Body that are systemic in nature, and consequently, we are seeing more and more developing country Members participating for systemic reasons. An important way in which developing countries have familiarised themselves in the appellate review process is by participating as third participants. Developing countries which have been third parties are likely to have found that their knowledge of the functioning of the dispute settlement system has been considerably enhanced by such participation. Not so many developing country WTO Members, however, have participated as appellants or appellees. Only 11 developing countries have appeared before the Appellate Body as either appellant or appellee. This represents less than one fourteenth of the total Membership of the WTO. The problems and constraints facing developing country Members in the multilateral trading system are well known. For many developing countries, access to the dispute settlement system is a costly exercise. Limited resources sometimes mean limited opportunities for engagement and participation. However, what is needed is the equality of access to means of engagement. In one of its earliest reports, the Appellate Body ruled that private lawyers could represent WTO Members in dispute settlement proceedings. This ruling was hailed as allowing access to the dispute settlement system by developing country Members, who often do not have the experience or expertise to represent themselves. But as I have said, good professional advice and representation is costly, and may be beyond the means of many small developing country Members. It is against this background that we welcome the establishment of the Centre. By providing low-cost, high-quality legal services, the Centre will enable the greater participation of developing country Members. The Centre will, therefore, benefit its Members. It will benefit panels, the Appellate Body, and the WTO. Ultimately, the Centre will benefit the “rules–based” multilateral trading system, and strengthen the notion that the dispute settlement system of the WTO is available to the economically weak as much as it is available to the economically strong. I would like to wish the Executive Director of the Centre, Mr Frieder Roessler, and his team, all the best. I myself will be retiring from the Appellate Body at the end of the year, and, will, unfortunately, not have the opportunity to follow the development of the Centre first hand. But I am sure that my colleagues who remain on the Appellate Body, and those who join the Appellate Body in December, will benefit from the Centre’s participation in, and contribution to, the WTO dispute settlement system. And I am sure that they will join me in wishing the Centre all the best in the future. To date, a total of 34 different WTO Members have participated as third participants, or as “passive observers” in Appellate Body proceedings, a number that represents slightly less than a quarter of the total WTO Membership. I would like to begin by thanking all the people whose idealism and hard work made the creation of the Centre possible. I believe that two of them deserve particular credit. There is first of all Claudia Orozco from Colombia, who conceived the idea of international legal assistance, developed the original proposal and helped negotiate the Centre’s Charter. It is thanks to her intelligence and imagination that this Charter places a bold concept into an institutional and procedural structure that ensures its efficient implementation. In my view, the Centre’s Charter is a masterpiece of checks and balances. It gives the Centre financial independence by creating an endowment fund of close to twenty million Suisse francs but subjects it at the same time to close budgetary scrutiny by its Members. The Centre’s fees for its services are set at levels sufficiently low to ensure that also poor countries can assert their WTO rights but also high enough to ensure that the Centre’s services are not wasted. The least developed countries are entitled to the services of the Centre without being Members of the Centre but are nevertheless represented on its General Assembly and Management Board. All these subtle compromises are the result of Claudia’s admirable capacity to combine her vision with a realistic assessment of how it can be made to work in the real world. I would also like to pay tribute to Otto Genee. As Chairperson of the Preparatory Committee, he made sure that the Centre could immediately start its operations when the treaty establishing it entered into force on 15 July 2001. It was thanks to him that only two days later the General Assembly could adopt staff rules, financial regulations, a budget, rules of procedure and a seat agreement and that it could also appoint all the officers of the Centre. Less than two weeks after the entry into force of the Charter I started working on an Appellate Body submission in furnished premises with Natacha Zofka as office manager. I do not believe that there is another international organisation that was operational as soon after its establishment as the Centre. We owe this achievement to Otto. Members of the Centre have requested the services of the Centre in four WTO dispute settlement cases and a fifth request is forthcoming. This leaves no doubt that the Centre is responding to a real need. We need badly staff to deal with this work load. I am happy to report that the Centre’s Recruitment Board has just decided, after interviews and written tests, to offer positions to three highly motivated and competent lawyers from three continents. The users of the Centre will therefore shortly be able to seek legal advice from altogether four experts in WTO law that have all had hands-on experience in WTO law. I believe that the Centre should remain a relatively small organisation and rely on outside expertise whenever the demand for its services exceeds its capacity to provide them. This will ensure that the Centre remains flexible and that it can respond quickly to changing needs of its users. The need to outsource may arise from large variations in the demand for its services, from conflicts of interests or from a lack of expertise. If two countries ask for assistance in the same case, the services provided to one of them may have to be provided by outside lawyers. The Centre might outsource complex intellectual property rights cases if it does not have an expert in this field on its staff. It might also decide to ask the law firm that has followed an anti-dumping or countervailing duty case under domestic law to handle the WTO aspects of that case. How the outside lawyers should be selected and what their relationship with the Centre and its users should be, still needs to be determined by the Management Board. The Centre may finance not only the services of legal experts but also those of technical experts. Its founders have created a Technical Expertise Trust Fund to help defray part of the costs of technical expertise to prepare the underlying technical dossier in fact-intensive dispute settlement proceedings. The Trust Fund is to be financed by donor governments and intergovernmental organisations and will therefore be operational only after pledges by donors have been received. I very much hope that such pledges can be made soon because one Member of the Centre has already indicated that it may require such technical expertise in a forthcoming WTO dispute settlement proceeding. One of the tasks of the Centre is to provide training on WTO law, in particular on the WTO dispute settlement procedures. Such training is also provided by the WTO, the UNCTAD and other organisations. The Centre should in my view avoid duplicating the work of others and not offer services others can provide more effectively. In the wide world of technical assistance, the Centre will have to find a niche not occupied by others. I believe that the Centre’s comparative advantage will be its day-to-day involvement in WTO dispute settlement proceedings. Its niche may therefore very well be on-the-job training of interns as well as information sessions, circulars and seminars to disseminate the knowledge that the Centre acquires through its own practical experience. I do not underestimate the challenge that I am facing as the first Executive Director of this new institution. The Centre must operate like an international organisation, with an institutional structure and financial regulations that give the donor governments confidence that the resource they made available are effectively used. However, the Centre must at the same time be managed like a law firm, with standards of efficiency that attract clients. My task will be to help minimise the Centre’s administrative burdens and maximise its output of services. The Centre is part of the WTO’s dispute settlement system, which would lack credibility if a WTO Member’s access to it depended on its legal expertise or resources. However, the Centre must also remain independent of the WTO and its Members if it is to fulfil its role effectively. While I recognise the challenges that the Centre is facing, I am confident that it will soon be perceived by all as an indispensable institution playing a constructive role in the WTO legal system. The ceremony for the inauguration of the newly formed Advisory Centre on WTO Law, which will fulfill a vitally needed role for giving assistance to developing countries in their activities in the WTO dispute settlement system, is an appropriate context for me to address some of the broader issues of the WTO, and to situate the beginning of this new Advisory Centre in that broader context. It is my intention to do this task in four major parts. First I will discuss the broader policy “landscape” in which the trade system is situated today, recognizing that the events of September 11th in New York City and Washington D.C. are having an extraordinarily profound impact, but not focusing solely on that feature. Secondly, in Part II, I will discuss the WTO as an institution and the importance of the institutional rules, treaty text, and practice for the success of the WTO and other organizations related to it. In this part, I will focus primarily on the non-dispute settlement features of the organization, namely the diplomatic and negotiating contexts that make various decisions and are creating rules or rule changes. In Part III of this talk, I will turn to the dispute settlement system, looking at its institutional role in the context of the broader “constitution.” And finally, in Part IV, I will turn to the new Advisory Centre, and its significance in this broader context. After the events in New York City and Washington D.C. on September 11, it is not possible to avoid the implications of what happened. In the United States, virtually every citizen knows the date of December 7, 1941. On that date, Pearl Harbor was attacked without warning by a foreign government’s military power, and it resulted in the United States essentially losing a major Navy Fleet. Approximately 2,400 persons (virtually all military personnel) died in that attack. On September 11, 2001, in New York City, several terrorist-hijacked airplanes attacked a symbol of western democratic institutions—the World Trade Center—in the heart of the New York trade and financial center. Substantially over 4,000 persons (virtually all non-military) lost their lives in this attack (and in another attack in Washington D.C.) and the World Trade Center itself was destroyed, inflicting potentially severe damage on the entire world economy. Thus, we can make some comparisons between these events, and it would not be folly to come to the judgment that the more recent event was several times more severe and disastrous than the previous one mentioned. Already we are seeing a variety of commentary and discussion about the impact of the September events. For example, there are those who say that this is the end of globalization, although there are other comments that oppose that. Among other things, we have seen major economic sectors such as travel (particularly air travel) and tourism, plummet, resulting in more than 100,000 job losses in airlines, and potentially many hundreds of thousands losing their jobs in the tourism industry. Tourism constitutes 10% of the U.S. economy, and apparently employs one million persons in Europe alone. Businesses will clearly be changing their practices. There is already a trend to limit business travel, and to rethink the global procurement ideas that had become such a part of the globalizing economy. The events of September suggest a whole new layer of risks on business activity, and thus a higher risk premium is considered necessary for an appropriate rate of return; therefore the capital value of investments decline. Other activities, such as the economics of skyscrapers and transportation, are being re-thought. We have seen the immediate response of huge public expenditures, and a shift in the budget priorities of major nations, obviously including the nation that was attacked, the United States. In responding to these challenges, governments may find it necessary, and are certainly tempted, to constrain certain types of liberties that had been taken for granted, including some liberties that are essential to the working of markets (such as freedom of information and freedom of movement of individuals in relation to their business needs). We are also seeing a considerable nervousness about other events in the world: a factory blowing up in Toulouse France, and a Russian plane that is somehow blasted out of the sky over the Black Sea. These may be relatively normal accidents, but there is the tendency to wonder whether they might be part of a broader pattern of terrorist activity. Perhaps one of the few bright spots in this landscape is that it seems to have created an international relations atmosphere that demands greater international cooperation. Perhaps, some might say, this is a wake up call to nations that might otherwise be tempted to indulge in unilateral measures without consideration of impacts on foreign societies. Of course it remains to be seen how long this new attitude toward international cooperation will persist. The other side of that coin is the utilization by special interests of the “excuse of terrorism” to obtain special government funding allotments and to pursue other objectives that long preceded the September events, but now are rationalized as more important because of the need to counter terrorism. Indeed, some of these activities seem to be profoundly affecting basic market economics principles, with the surge in government spending leading some to rethink the advantages of reliance on market and non-government institutions in society. In terms of trade policy, the whole idea of “subsidies” may need to be rethought, as well as other principles of the world trade system. Economists generally, and more particularly Nobel Prize winning economists over the past decades, *2 have often stressed the importance of institutions in the functioning of markets. Without an institutional framework, markets simply will not work. This framework can be comprised of various types of human institutions, such as practice, culture, particular bidding structures, etc. But legal rules are the most prominent of the institutional frameworks for markets. Thus, since legal rules almost always require governments, governments become central to markets (contrary to some statements by ideologically-oriented persons who think less government is always better). The previous most important innovation of institutions regarding international economic relations was the development of the Bretton Woods institutions, starting with the 1944 Bretton Woods Conference, and running through the end of the 1940’s. The 1944 Conference created the World Bank and the International Monetary Fund, and the negotiations for a similar organization for trade (the third leg of the tripod of Bretton Woods institutions) continued through 1948. But as is commonly known, the potential International Trade Organization, or ITO (of the Havana Charter of March 1948) never came into effect, largely because of objections in the U.S. Congress. However, the General Agreement on Tariffs and Trade (GATT) was in place for some very special diplomatic and national constitutional reasons (particularly the structure of the United States Constitution and its authorities delegated to the President). The GATT continued, therefore, to play a role that gradually became enhanced, as it filled the vacuum left by the failure of a trade organization to come into being. This role became increasingly important as decades wore on, but it also became clear, with the passage of time, that the GATT had substantial institutional defects*3 that made it harder and harder for it to cope with some of the new issues being thrust upon it. Thus, in the Uruguay Round, which added several huge new subjects to the trade system competence (especially intellectual property and services), it was considered necessary to create a new organization, the WTO. All of this is familiar ground. One of the lessons of this is the important contribution that was made by the institutional fathers of the Bretton Woods system (including all three legs of the stool). The basic objective of these persons was to prevent another world war of the catastrophic nature of World War II. In that respect, the system can claim a considerable amount of success. Clearly, the institutions created have contributed to the prevention of a cataclysmic World War III. But one of the key questions is whether those institutions are still appropriate to the kinds of problems that are being faced by the world today, including financial crises, tendencies towards partitioning markets, both by nation state protectionism and excessive regionalism, and of course, the operation of terrorism, and how that affects market institutions. At this point, I’d like to turn for assistance to some outstanding academics and their writings. I realize that in an audience like this, to address issues that are more academic and not so oriented on near-term problems is something of a luxury. I too have felt that way when I was serving in my government, and I regretted that I seemed to be spending intellectual capital, and often not renewing it adequately. So with that small apology, I would like to broaden the context of my talk this morning, to look at some of the thinking about the institutions that are critical for international markets. In particular, I refer to an extraordinary lecture delivered by Professor Robert Keohane, of Duke University, who was the President of the American Political Science Association for the year 2000. In that capacity, he delivered the annual Presidential lecture, which is a careful, long, thoughtful, and I must add, very dense speech. *4 I can’t possibly go into very much of this lecture, although I commend it to persons who would like an extraordinarily thorough overview of political science with regard to our subject, but I think there are two key points for us to consider. One is a list that Professor Keohane puts forward of prerequisites for successful social institutions. Second, is the importance of norms, or rules, as part of the institutional structure for enhancing the potential success of markets. Second, he notes the importance of participation that is open to all, particularly in the process of rule-formulation, but maybe also in the process of rule-application. Thirdly, he notes the importance of persuasion in a thoughtful and non-polemic way. He notes that there is a necessity for institutionalized procedures to ensure that this type of persuasion can have its important impacts. The second major category that many thinkers (including Professor Keohane) stress is the importance of rules or norms. These rules have considerable importance to markets, particularly markets that are based on decentralized decision-making of private enterprises, which number in the millions. As I myself have written, these market participants find it more efficient to have a certain degree of predictability and stability, *6 which rules can provide, and thus reduce somewhat the risk of their entrepreneurial decisions. Keohane and the thinkers that he relies on note that the rules should have certain characteristics such as hindering manipulation, allowing third party discourse, providing for precedents; and thus: predictability, stability, and being created through impartial processes. There has been much discussion recently about the appropriate scope of WTO activity, or the dimensions of its “competence.” Occasionally, people have said that the WTO has become overloaded and threatens to be further overloaded, and these persons (ignoring the fact that overloading is mostly a function of lack of government will to provide the necessary resources) sometimes advocate that the WTO return to its “central responsibility, which had been confined to border measures that limited trade.” This view is a serious misunderstanding of the history of the GATT. From the very beginning, the GATT text provided great attention to internal government measures affecting trade, as well as border measures. Article III paragraph 4 is an extraordinarily broad and sweeping clause, requiring non-discriminatory treatment (“National Treatment”) in the application of virtually all types of internal economic regulation, as affecting imports. In the early decades of the GATT, most negotiating attention was upon tariff reduction, and this process was extraordinarily successful. But by the 1970’s, it became clear that tariffs were no longer the really important policy issues for trade liberalization. There had been a substantial shift to “Non-tariff Barriers” (NTBs), partly as an alternative to low tariffs sought by constituencies in order to limit competition, and thus give them greater shares of the producer surplus. Therefore, it became clear that attention toward internal government measures would have to be increased. Thus in the Tokyo Round a great deal more than usual attention was put upon non-tariff barrier measures, resulting in a series of side codes (partly because of the difficulty of amending the GATT) that addressed a variety of such non-tariff measures, including subsidies, customs valuation, product standards, government procurement, etc. Likewise, the Uruguay Round went considerably further in this regard, pulling together almost all of these side codes into a “single package” becoming mandatory on all members of the WTO. This surely has been a very major step in the right direction of providing the necessary institutional framework for markets to work. But it has not been without pain. Such attention to the internal regulatory activities of governments has brought its share of backlash. It has also induced some advocates, some of whom are clearly motivated by the desire to prevent competition and market forces from operating to their short term detriment, to object to further addition of subject matters underneath the WTO umbrella. There may indeed be arguments why certain additional subjects should not be brought under the WTO umbrella, but those arguments are not reasonably based on some a priori notion that the GATT/WTO has certain “inherent limitations” to its appropriate competence. In fact, when you read the GATT and other Uruguay Round texts, including Article III, and when you consider the way the world’s “globalized economy” has been developing, it becomes reasonably clear that virtually every economic regulatory subject regarding activity and economic influences that cross nation state borders (and virtually all do) could logically be included in the WTO reach. There needs to be some kind of international cooperative institutional mechanism to address these regulatory problems in a way that nation states are increasingly unable to do successfully. Thus, logically, subjects such as competition policy, investment rules, labor standards, environmental standards, etc. could be subjects for the WTO competence. But there are also reasons not to bring such subjects under the WTO umbrella; reasons that are not based on an a priori rigid, taxonomic view of the WTO institution, but rely more on a pragmatic consideration of the resources and competence available in the WTO as an organization and the limitations on those resources, as well as ideas about whether the “inside the Geneva beltway” mindset is capable, at least in the near term, of addressing some of the more complex, and possibly ambiguous, policies involved. In addition, of course, some of the subject matters, if brought under the WTO tent, could be utilized in a way that has little to do with the basic purposes of liberalizing trade while balancing other social policies. In short, there is a danger of the misuse of some of these subjects for protectionist reasons. Indeed, some rethinking could be important for the questions of “single package” and “most favored nation.” There are some issues that increasingly need to be addressed by an international institution of some sort, but there is little pragmatic reason to require all 142+ WTO Members to embrace rules for those subjects. Maybe half as many nations would provide more than 90% of the market activity relating to those subjects, and that half of the Membership would provide an important critical mass for a core group for addressing some issues (as exemplified by telecommunications and financial services). Maybe competition policy, investment, and the environment are other issues ripe for such consideration, and maybe some rethinking is necessary for the intellectual property area. All of these are conjectures, and it is also the case that it may be necessary, particularly in the face of a too-rigid consensus approach to decision making, or because of the risks of misuse of WTO power in certain circumstances, to go elsewhere to some other kinds of institutions, maybe some of which might be loosely affiliated with the WTO. In any event, there are many different kinds of institutional structures that could be considered, and attention is vitally needed to these broader, systemic issues of the world trading system. Much of what I have said above also relates to the question of “sovereignty,” which is a concept that is certainly much abused. Indeed, this concept has been characterized as “organized hypocrisy” by an outstanding academic who has written extensively on this subject. *7 Often, sovereignty is invoked for special interest-pleading that has very little to do with the true issues of institutional structure for international economic relations. Basically, it is my view that the real issue of “sovereignty” is the question of allocation of decision-making authority. It is the question of whether a certain kind of decision should be made in Geneva, Washington D.C., Sacramento, or Berkeley (or in the European context: in Geneva, Brussels, Berlin, at the Länder (state) level, or finally at the city level). This is a subject for other discussions and writings, *8 but it is important to recognize that it is vitally intertwined with the question of institutional development of the WTO. At this point, it is necessary to turn to the WTO dispute settlement system. 1) A sense of fairness that the players or participants in the system can expect to be treated even-handedly, and relatively impartially, so that they will be operating on a “level playing field” of trade policy. Thus, developing and least developed countries have a chance for some redress of grievances that result from countries (even large, developed countries) departing wrongfully from the rules. Especially in an era of globalization and terrorist peril, such a sense of fairness is significant, partly as an antidote to “pure power exercise,” or what has been termed “power-oriented diplomacy” rather than rule-oriented diplomacy. 2) A second value recognized by many perceptive thinkers is that a rule-oriented system tends to reduce, at least moderately, the risks that entrepreneurs take and gives those entrepreneurs a higher degree of security, stability, and predictability. Another way of expressing this is that such a system reduces the “risk premium” of a variety of economic decisions, including investment decisions. A reduction in the risk premium means that the risk taker can accept a somewhat lower return on his investment or other decision, and in the aggregate, when this is a situation generally prevailing, this reduction in the risk premium is a reduction in transaction costs as well. Altogether, these factors would normally represent a substantial increase in the efficiency of economic activity, and thus, an increase in world welfare. 3) However, the dispute settlement system faces a degree of unease from many of the “old hands” and experienced participants. It is clear that an effective dispute settlement system has certain impacts on “sovereignty.” Nation states find themselves constrained as to what they may want to do with respect to their internal policies, because certain measures may be inconsistent with the international rules, and a dispute settlement system can so declare, making it much more difficult for an errant nation state to take such inconsistent measures. Yet, clearly there is a benefit to be obtained, as mentioned above, which can be considerably greater than the small inroads on sovereignty. As businesses begin to accept the effectiveness of a rule-oriented system, and begin to take account of it in their strategic planning, it generally seems that such businesses see a value in the system, even though they may feel that they have less opportunity to affect their own nation’s activities. The rules and the method of implementing rules (such as a dispute settlement system) also have an impact on citizens, and this impact is growing as more and more issues of internal government regulation fall under the umbrella of the WTO system. So far, the reform of the dispute settlement system represented by the new procedures of the WTO and the Uruguay Round text appear to be extraordinarily successful. As this is written, in November 2001, there have been, in the period of the WTO’s existence (slightly less than seven full years), approximately 240 complaints brought under the dispute settlement system, about 53 of which have resulted in concrete findings, as expressed in a report, either of First Level Panels, or of the Appellate Body (a new part of the dispute settlement procedure introduced by the Uruguay Round text). Overall, this jurisprudence constitutes somewhat more than 11,000 pages, and in fact, is enormously rich. Yet, there are worries that the dispute settlement system is too secretive, and lacks transparency. There are also worries that it is not open to participation of important players, including non-governmental entities. The “government-to-government” approach of the dispute settlement system is what particularly annoys some of the observers, although there are arguments to support that characteristic of the system. Sometimes diplomats find themselves as frustrated as national sovereigns in the parameters imposed upon them by the treaty texts as implemented by the dispute settlement system. Furthermore, although there are a few notorious examples of non-compliance in relation to some of the completed dispute settlement reports, on the whole there appears to be a very good record of compliance, including compliance by some of the most powerful nations who are utilizing the system. In addition, many of the complaints brought are being settled or otherwise disposed, on bases that appear to be amicable, between the disputing parties. This is a good sign that the dispute settlement system is playing a more efficient role in providing for dispute settlement; particularly dispute settlement that is consistent with the overall rules. However, there are manifestations within the processes of the WTO that have resulted in strident criticism of the dispute settlement system, some of which criticism apparently indicates a lack of understanding of a rule-oriented system or the processes by which a judicial-type body needs to operate. *14 The procedures clearly need attention, and the final Ministerial conference of the Uruguay Round at Marrakech, Morocco in April 1994, decreed that there should be an overall review of the dispute settlement system within the first four years of its existence. Unfortunately, the Members of the WTO have not been able to achieve this review. Various countries have put forward lists of reforms that they would like to see (or at least see discussed) and an amalgamation of such lists can easily number more than 200 items. Many of these items however, are relatively matters of “fine-tuning,” yet there are some important reform issues for the dispute settlement system that need serious attention. One of the concerns that disinterested observers can have about the WTO is that the relative paralysis of the non-dispute settlement parts of the organization is also inhibiting the evolution and improvements that are needed by the dispute settlement system. There is discussion of the size and nature of the Appellate Body, for example should it be constituted of full-time Members rather than part-time? Should it be enlarged?). There is also discussion of whether the First Level Panels, which are now appointed ad hoc from a variety of personnel (many of whom are officials of Member Governments, and thus are generally not paid for their extra services to the WTO dispute settlement system) should be reformed into a permanent roster-type arrangement similar to that which the Appellate Body has. In some of these struggles, one can detect a certain ambivalence about the new dispute settlement procedures, even among the major powers, which were rather ardent proponents of the reforms developed in the Uruguay Round, but may now be back-tracking slightly because of some of the political troubles that specific dispute results have had for them. To some extent, these problems mentioned above can be discussed as parts of a broader “power struggle” between the dispute settlement system and its officials on the one hand, and the diplomat/negotiators and their efforts on the other hand. To the extent that the diplomatic/negotiation side of the WTO becomes increasingly unable to perform its obligations (decisions and negotiation of new rules), there is a strong temptation by various actors within the system to take their problems to the dispute settlement system, and this, in turn, may be posing excessive burdens on the dispute settlement system, in the sense of causing the dispute settlement system to address issues and legal problems that are not particularly appropriately addressed in a rule-applying, or judicial-type institution. Many of these issues really need to be solved by the negotiators, as part of a rule-making process, rather than a dispute settlement/judicial process. One of the characteristics of the activity under the dispute settlement system so far in the WTO has been the remarkable amount of developing country participation. Of course, developing countries are sometimes the target of complaints by developed countries. But many developing countries have, themselves, become complainants against other Members of the WTO, including some of the important industrialized country Members. This participation of the developing countries in this system is, in the opinion of many, absolutely vital to the long term durability and effectiveness of the WTO dispute settlement system, and therefore, probably of the WTO itself. If the WTO is seen to be tilted, or unbalanced with respect to an important attribute of membership, namely access to the dispute settlement procedures, this undermines the sense of fairness and, to some extent, the essential value of being a member. The dispute settlement system thus offers considerable opportunity for fuller participation as member in the WTO system, and that is already manifest by the number and distribution of cases brought. However, experience is showing that participation in the dispute settlement process has some very considerable costs, costs that are not easily borne by developing countries, and particularly the least-developed countries. There are several dimensions to these costs. First, many of the developing countries that would like to participate in the dispute settlement process, find that they do not have the expertise in their government service and ministries to do effective work in connection with the WTO dispute procedures. For a while, those procedures either prohibited or greatly inhibited the use by nation states of private counsel, hired to work with them on cases, and to present cases in the WTO procedures. But as of several years ago, it appears that that hurdle has been overcome, and now it is quite common for governments, especially smaller governments and developing country governments who do not have “in house expertise,” to retain outside counsel to help them. But this, too, has its costs. The fees for such help can be quite onerous for poorer countries. The very best help, of course, can command fees commensurate to their work with other clients, including very large corporations, large and rich governments, etc. Thus, to obtain the benefit of these highly skilled persons, the developing countries find they must pay significant sums. In some cases, they feel that these sums are beyond their abilities to provide, and yet, they feel they have rights to affirm, and need the legal profession’s assistance. Many nation states have already realized this phenomenon in connection with their own internal legal systems, and have developed institutions of “legal aid,” for providing trained lawyers’ assistance to the poor. By analogy therefore, it has seemed to some inspired leaders within the WTO that a similar arrangement could be developed for the WTO dispute settlement system. And thinking along those lines has indeed resulted in the new institution being inaugurated today, namely the Advisory Center onWTO Law, as a centre to assist developing countries. Under the rules of this Centre, developing countries will have access to assistance from an internal, small legal staff of the Advisory Centre, and in some cases will receive assistance to hire other private attorneys to help them. The Advisory Centre will charge fees for this help, but the fees will be scaled down, according to the wealth of the country seeking aid. In some cases, for the very poorest of the countries being assisted, the fees may actually be zero. One of the ingenious facets of the procedures established by the new Advisory Centre is that it combines its assistance for advocacy with a moderate mission of training. Part of this training can be accomplished by asking an assisted country to provide a person who will be a sort of “intern,” working with the Advisory Centre staff on the case for his or her country, and thus receiving experience in that process. This type of capacity-building is certainly welcome, and some people believe that the Advisory Centre will also engage in some other types of training activities along the same line. Some of the issues facing the new Advisory Centre will not be easy to handle. The Centre will obviously need to understand some of the broader trends of the WTO negotiating and dispute systems, so as to better serve its clients in its advocacy. This is because the panelists or Appellate Body Members that will be responding to legal questions, will also need to respond with a knowledge of the context of those questions, and this necessitates an understanding of where the WTO institution currently stands, and where it is headed. Also, the Advisory Centre will undoubtedly be called upon to make recommendations about certain reforms, presumably focusing, or even confining, its attention to reforms about which it has the most expertise, namely the procedures of the dispute settlement system. However, in carrying out its responsibilities, particularly in connection with the broader institutional setting of the WTO and providing expertise in relation to proposals for reforms, the Advisory Centre will necessarily need to separate its advocacy role rather strongly from its policy preferences. It has an obligation to its clients under professional ethics (some of which will be newly developed as part of the procedures of the WTO) to be a vigorous advocate, and utilize strong arguments on behalf of its clients. But it will need to consider, probably on a case-by-case basis, the degree to which its advocacy role is consistent with expressions of policy preferences or suggestions about reform of the dispute settlement system. Needless to say, the Advisory Center, in this respect, will have some delicate tasks ahead of it, but there is every confidence that its structure, personnel, and leadership will be able to cope with these problems and dilemmas. Finally, let me draw this article to a close with an expression of several simple propositions. Clearly, the dispute settlement system is very central, and extremely important for the WTO and for the WTO’s future as an institution that helps make world markets work. It is also clear that the strength of this WTO dispute settlement system depends on a world perception that it is fair and even-handed. And that perception, in turn, depends on the ability of all members of the WTO to have essential access to the dispute settlement process, even when they lack resources to do so on their own basis. Thus, the Advisory Centre will play an extremely important role in assisting the relatively new organization of the WTO to better achieve some of its purposes and goals, which in turn, are so vitally needed in the type of world that is developing at a rapid pace. This article is adapted from the keynote lecture delivered by Professor John H. Jackson at the ceremony for the inauguration of the Advisory Centre on WTO Law, held in Geneva at the WTO, on October 5, 2001. The talk was delivered from rough notes, and was not recorded, so this article is partially a reconstruction as well as a subsequent editing and abridgement of that talk. See North, Douglass C. Institutions, Institutional Change, and Economic Performance Cambridge: Cambridge University Press, 1990; Coase, Ronald H. The Firm, the Market, and the Law (1988). See, e.g. Jackson, John H. The World Trading System: Law and Policy of International Economic Relations. 2d ed. Cambridge: MIT Press, 1997; Jackson, John H. The Jurisprudence of the GATT and the WTO: Insights on Treaty Law and Economic Relations. New York: Cambridge University Press, 2000; Jackson, John H. The World Trade Organization: Constitution and Jurisprudence. Chatham House Papers. London: Royal Institute of International Affairs, 1998. Keohane, Robert “Governance in a partially globalized world.” Presidential address, American Political Science Association, 2000. The American Political Science Review. Mar 2001. Habermas, Jurgen. Between Facts and Norms: Contributions to a Discourse Theory of Law and Democracy. Cambridge: MIT Press 1996. See Jackson, John H. “The Great 1994 Sovereignty Debate: United States Acceptance and Implementation of the Uruguay Round Results.” Columbia Journal of Transnational Law 36 (1997): 157-88 and Jackson, John H. “Sovereignty, Subsidiarity, and the Separation of Powers: The High Wire Balancing Act of Globalization.” Conference Proceedings-University of Minnesota Law School, Conference to Honor Professor Robert E. Hudec, September 2000. Forthcoming-Cambridge University Press. See Jackson, John H. The World Trading System: Law and Policy of International Economic Relations. 2d ed. Cambridge: MIT Press, 1997, Ch. 4; Hudec, Robert E. Enforcing International Trade Law: The Evolution of the Modern GATT Legal System. Salem, N.H.: Butterworth Legal Publishers, 1993. The phrase “WTO Charter” refers to the Agreement Establishing the World Trade Organization. See, e.g., Jackson, The World Trading System, The MIT Press (1997) at page 109; Jackson, John H. The World Trade Organization: Constitution and Jurisprudence. Chatham House Papers. London: Royal Institute of International Affairs, 1998 at Chapter 4. Appellate Body Report, US – Import Prohibition of Certain Shrimp and Shrimp Products, WT/DS58/AB/R, adopted 6 Nov. 1998, para 121. and US – Import Prohibition of Certain Shrimp and Shrimp Products, Recourse to Article 21.5 of the DSU by Malaysia, WT/DS58/AB/RW, adopted 22 Oct. 2001. Appellate Body Report: EC – Measures Affecting Asbestos and Asbestos-Containing Products, WT/DS135/AB/R, adopted on 12 Mar. 2001. The Advisory Centre on WTO Law will be formally inaugurated on 5 October 2001 at 3:30 p.m. in the Centre William Rappard, 154, rue de Lausanne, Geneva. The speakers will be the Ministers of Trade of Colombia (Marta Lucía Ramirez de Rincón) and of the Netherlands (Gerrit Ybema), the Director-General of the WTO (Mike Moore), the Chairperson of the Appellate Body (Claus-Dieter Ehlermann), the Executive Director of the Centre (Frieder Roessler) and the Chairperson of the Management Board (Said El-Naggar). Professor John Jackson of the Georgetown University will deliver a key note address. All WTO Members as well as interested academics, WTO officials, law firms, non-governmental organisations and the press have been invited to attend. The Centre is an international organisation independent of the WTO which was established to provide legal training, support and advice on the law of the WTO to developing countries, in particular to the least developed among them, and to countries with economies in transition. The Centre may under certain circumstances also finance legal assistance and technical expertise provided by outside sources. A proper balance of rights and obligations under WTO law can only be maintained if all WTO Members have a full understanding of their WTO rights and obligations and an equal opportunity to resort to the WTO dispute settlement procedures. Therefore, the Centre will make vital contribution to the rule of law in international trade and the credibility of the multilateral trading system. 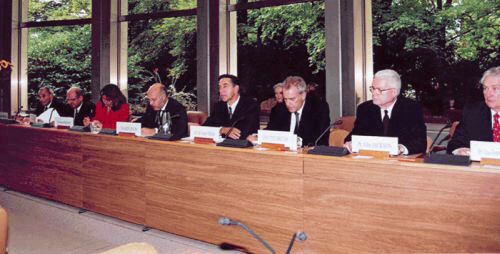 The Agreement establishing the Centre entered into force on 15 July 2001 and the constituent meeting of its General Assembly was held on 17 July 2001. Of the thirty-two signatories of this Agreement, nine are developed countries, twenty-two developing countries and one economy in transition. The forty countries designated by the United Nations as least developed countries are entitled to the services of the Centre without having to accept the Agreement establishing the Centre. Membership of the Centre remains open to all WTO Members and States or customs territories in the process of accession to the WTO. Jordan will be the first country to accede to the Agreement establishing the Centre. Once all signatories have completed their domestic approval procedures and Jordan has acceded, there will be altogether fifty-four Members of the WTO that will be entitled to the services of the Centre. The General Assembly appointed at its constituent meeting the members of the Centre’s Management Board, which is responsible for the effective and efficient operation of the Centre. The Management Board appointed Frieder Roessler as Executive Director. Mr. Roessler was previously Director of the Legal Affairs Division of the GATT and the WTO and taught international economic law at various universities. The Centre is currently located at Chemin Louis-Dunant 19 next to the new office of the World Bank in Geneva. In July 2002, the Centre will move to new premises in the business centre “Les Nations” (Avenue Giuseppe Motta 31-37) presently under construction. Even though the Centre is still in its start-up phase, its Members have already requested its services in four WTO dispute settlement cases. At present the staff of the Centre is planned to consist of the Executive Director, four lawyers, one office manager and one secretary. The office manager has already been hired. Recruitment of three lawyers is currently underway. The capacity of the Centre will be expanded in response to the demand for its services. – Professor John Jackson, Georgetown University Law Center, Washington, D.C.
– Mr. Claus-Dieter Ehlermann, Chairman of the WTO Appellate Body. I am very happy to be here with all of you today. The ACWL’s 15 years of excellent and outstanding work is really something to be celebrated. It is also a very auspicious occasion to inaugurate the new conference and training rooms. I was here in Geneva, probably as a Secretary in the Brazilian Mission, when we started talking about the creation of the ACWL. In the early stages, I thought the idea was very complex but I shared entirely the objective and the goal that was behind the idea of the ACWL. This was that if we did not offer the developing countries, particularly the smaller ones, the least-developed countries, a fair opportunity to participate in the dispute settlement system, the WTO would really not be doing its job. So it was very important to figure out a way of allowing these countries to participate. I was already at that point in time doing dispute settlement proceedings as a diplomat and I could see how complex, how difficult it was, and how costly for developing countries, even like Brazil, which had some resources, to participate in the system. Imagine how much harder it was for those with even less resources and opportunities to do that. So I am very happy to see that, not only did the ACWL prosper as an institution that is fundamental to the work of the WTO but that it did so by providing the highest level of performance and services to the countries that really need this service. So in the WTO today, I think the success of the dispute settlement system is to no small extent due to the contribution that the ACWL has made. If it were not for the ACWL, we might have an even more asymmetrical system than we have today. It is already inherently more asymmetrical because for small countries and delegations, it is difficult to participate in the system. I am very happy with the success of the ACWL. Pretty much like our very own system in the WTO, the ACWL is also somehow a victim of its own success. The ACWL has a lot of work, and is probably overworked. The ACWL participates in around 20 per cent of all disputes in the WTO. That is a lot -20 per cent. This does not include the opinions that the ACWL has to write. I understand that the ACWL has already provided 2100 legal opinions. The rate today is about 200 opinions per year — that is also a lot of work. I would like to stress the importance not only of the people who work here but also the importance of those who make it possible. The donors play a very big part here. I want to thank them for being committed throughout these 15 years and I hope that they will be committed for the future as well. The ACWL provides a very important service. It is an indispensable part of the multilateral system today, even though it is not in the WTO. I see this as an integral part of what we do in the WTO. Again, thanks to the donors that have been contributing, and I urge them once again to continue to give that support. I have very close relations with the ACWL. I have been in this building a few times as a diplomat working on the EC – Sugar case. I think we worked together on the EC – Chicken Cuts dispute as well. I was here discussing these cases with the ACWL and I appreciate very much the quality of the work that they do. Of course, to a large extent, this is due to the leadership that was imparted here, first with Frieder and now with Niall, and I have to praise these two extraordinary leaders. I am very happy to see that the ACWL is not only looking good now but is shaping up well for the future, thanks to the contributions of people of this calibre. So my very warm congratulations to the ACWL, to all of you, and I hope that I will be around to celebrate the 30th anniversary – not as Director-General though!